Are you just a Big Splash? As an engineer, I learned about laminar flow. Let’s take the example of water for a minute. A lot of engineering science goes into what’s called laminar flow, which means aligning all the molecules of water in the same direction. We know from our science work in high school that water is made up of H2O, two hydrogens, and one oxygen molecule. When the engineers start filtering and aligning and pushing each one of these molecules in precisely the same direction, that’s known as laminar flow. Water in laminar flow is incredibly powerful. It can cut through solid steel. If it doesn’t quite achieve laminar flow, all it does is splash off the surface because there’s no alignment of the molecules. Is your team able to cut through the toughest issues or does it just splash and get everyone wet? Implied in that statement is that he, and maybe he alone, knows the truth. Those other poor, well-meaning souls only have their perception. Unfortunately, many people believe their perception is the truth. Every day, more brain research is showing us that what we see and hear is processed through multiple brain centers dealing with memories, beliefs, emotions, and others before the image, or the audio file is stored in our memory. That means from the time we observe something through sight or sound, it’s completely processed in our brain based on who we are before the memory is stored in our brain. Unfortunately, we think of our memory as if it were a computer hard drive. It’s a poor analogy. With a hard drive, we can go back several years later and retrieve the data that was placed on the hard drive, and it’s exactly the same data that was initially stored. But when we retrieve data from our brain, it has been constantly modified before placing in memory. We have further learned that even after a memory has been placed in our brain, it is continually being modified with every new experience from the moment it was initially stored. We don’t have reality in our brain. We only have our perception, and even that is being continually modified. 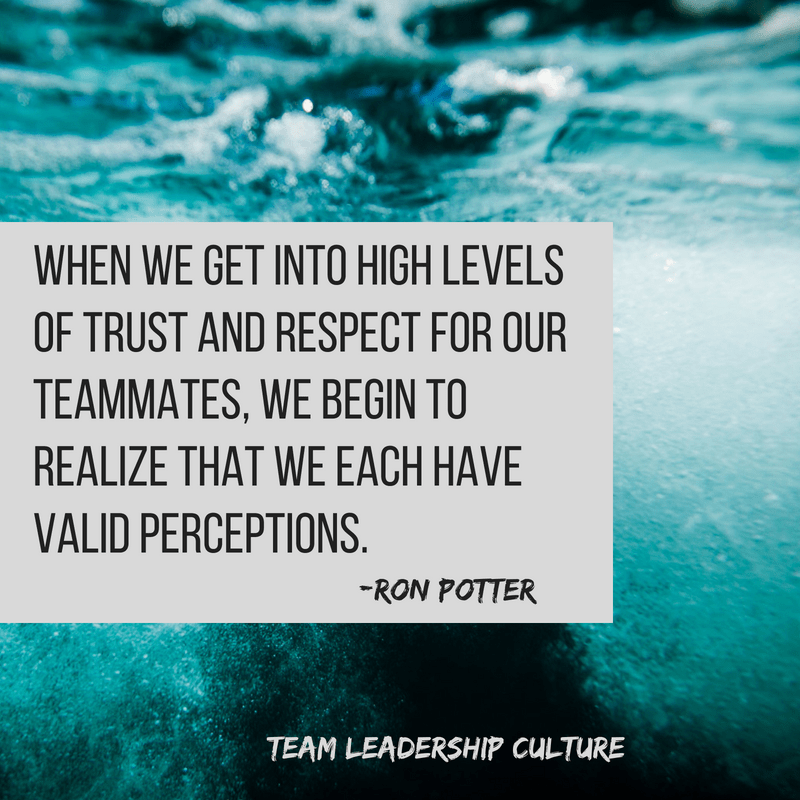 When we get into high levels of trust and respect for our teammates, we begin to realize that we each have valid perceptions, and our jobs as members of the leadership team are to form our collective reality from the multiple perceptions. We do this, so we can align and move forward together. We have different perspectives. But, we need to build a valid ‘reality’ of our perceptions so that we can move forward together. Without it, we will continue to move in different directions, diluting, diffusing our energy and trust, and creating nothing more than a big splash. When we line up all the “molecules” of our perceptions we begin to generate some real power.